Food insecurity is still a great concern for many households in South Africa. This situation is connected to the high level of poverty that exists in the country, particularly in rural areas. Rural households use five key pathways to address their food insecurity and poverty: an agricultural path; a multiple-activity path; an assistance path; a micro-enterprise path and an exit path. Using this framework of pathways, this paper presents a philosophical argument exploring the role agricultural extension can play to realise the goals of food security and poverty alleviation in South African rural households. Drawing on relevant published works, this paper argues that extension is particularly well positioned to address food insecurity and poverty through the instruments of technology transfer and innovation, human capital development, social capital development and increasing market access. These instruments were found capable of influencing the full range of pathways when applied through the agricultural path. Establishing food security, particularly household food security, is widely acknowledged as an important milestone in advancing the living standards of the rural poor. One avenue toward realizing this is through small-scale agriculture, which can be fostered through appropriate agricultural extension. However, food security programmes and extension approaches and agendas often are not compatible. Food security has about 200 definitions (Hoddinott, 2001). This study, however, makes use of the definition given in the State of Food Insecurity 2010 report by the Food and Agricultural Organization (FAO) which states: "food security is a situation that exists when all people, at all times, have physical, social and economic access to sufficient, safe and nutritious food that meets their dietary needs and food preferences for an active and healthy life" (FAO, 2010:8). Although, globally, sufficient food is produced to make it possible to achieve food security (Islam, 1995), the number of undernourished in the world has increased from about 840 million in 1996 (FAO, 1996) to about 925 million in 2010 (FAO, 2010), with 98% living in developing countries (FAO, 2010). The United Nations Children's Fund (UNICEF) indicates that at least 150 million children are undernourished, 32 million of whom live in Africa (UNICEF, 2001). This demonstrates that producing sufficient food globally does not necessarily imply equitable and proportionate distribution among people. Similarly, sufficient food production nationally may also not translate to food security at the household level, as is the case in South Africa (van der Berg, 2006). It can also occur that a household has sufficient food, but it is inequitably distributed within the household (Hyder et al., 2005). (c) Inequitable intra-household access to food. Poverty, which falls into the second category, is strongly correlated with food insecurity (Barrett, 2010). Therefore, it is necessary to address poverty and food security simultaneously. Further, it is of value to establish how agricultural extension can contribute simultaneously to alleviating poverty and achieving food security. This paper will explore this question by discussing South Africa's food security condition, food security as a public and an economic good, pathways for households to exit poverty and food insecurity, agricultural extension in relation to achieving food security, and agricultural extension paradigms. The paper will finally suggest ways to achieve this dual objective by synthesizing the objectives of public agricultural extension with the food security and development targets. South Africa produces enough food to feed its population, but experiences rapidly increasing rates of household food insecurity (van der Berg, 2006). Although employment has risen in the country, it has not attained the level where it can significantly address the issue of income poverty (Aliber, 2009). Further, while the national government provides social grants which help to minimize the rate and effect of food insecurity within the country, 40-50% of South Africans live in poverty (Machethe, 2004 citing Terreblanche, 2002). Approximately, 35% of the total South African population - about 14.3 million people - experience hunger and under-nutrition (Rose & Charlton, 2002), the majority being children, women and the elderly. Recently, prices of wheat and maize, which form part of the staple foods in South Africa, have increased in world markets (Heady & Fan, 2008). This development worsens the food insecurity condition as households now face more difficulties in procuring food items from their earnings. As the FAO (2009) notes that landless and female-headed households, together with both the rural and urban poor, constitute the major groups most affected, this situation is likely to persist over the next decade (Heady & Fan, 2008). Other factors contributing to the food insecurity situation of South African households are increases in the cost of electricity and oil prices. The electricity price is set to increase by 100% between 2008 and 2011. Regular increases in the oil price result in higher prices for food items and fertilizer, the production of which petroleum forms an indispensable input. The cost of transportation also increases, forcing food prices to increase proportionately (Altman et al., 2009). In 2008 an estimated 39.26% of the total South African population lived in rural areas (World Bank, 2010). Further, 65% of those identified as "poor" and 78% of those identified as "chronically poor" reside in rural environments (Woolard & Leibbrandt, 2002). These statistics suggest that interventions to combat food insecurity in South Africa should be largely directed to rural communities. Smallholder agriculture is a major tool for creating employment, for human welfare and for political stability in sub-Saharan Africa, particularly in rural areas (Delgado, 1998). Further, small-scale agricultural production helps reduce rural poverty and food insecurity (Lele & Agarwal, 1989). South Africa is no exception to this experience. Machethe et al. (2004) report that of the total household income in rural South African households, smallholder farming constitutes the greatest single source of that income; it accounts for over 40% of the total household income. Other sources of income identified by Machethe et al. (2004) were non-farm income including pension remittances, wages, family businesses and other sources each of which was less than 40% of the total household income. Given that, worldwide, most poor people live in rural areas and that agriculture is their main source of livelihood, focusing on factors that will enhance smallholder agriculture will bring about a lasting solution to the problems of rural poverty and food insecurity (Lopez, 2002). "In the area of food security, one such good might be a supply of cheap food made available to the poor through a public food distribution system. In other cases, the pursuit of food security might even require that private goods (such as land) be taken from a traditionally privileged category of citizens, with or without compensation, for redistribution to disadvantaged citizens. In still other cases, food security might require government action to reduce racial prejudice or gender inequity." Furthermore, Diouf (2002) argues that the voluntary signing of the World Food Summit Pledge by the governments of the UN member states to halve the current food insecurity rate is an indication of their full acknowledgement that food security should be treated as a public good and all governments must address food insecurity. The implication is clear: the importance of government in ensuring food security to its citizens cannot be overemphasized. Considering food security as an economic good, agricultural economists Johnston and Kilby (1975) and Eicher & Staatz (1984) reported that aggregate economic output and employment rates receive quicker and better growth when development interventions are concentrated on peasant and small-scale farmers. Conversely, some social scientists argue that service delivery, mainly aimed at increasing production by small-scale poor producers in remote locations, will only result in low yields and declining results (Farrington et al., 2002; Berdegué & Escobar, 2002). The South African government has applied various strategies to address poverty and food insecurity within the country. It has used social grants and, over decades, has established a number of institutions and programmes focusing on food security including the National Nutrition Council (established in the 1940s), the National Nutrition and Social Development Programme (established in 1990), the Community Based Nutrition Programme, and the Primary School Nutrition Programme (both established in 1994). Addressing broader issues in food security, the Integrated Nutrition Strategy (INS), also established in 1994, focused on land reform, agricultural credit provision, infrastructure and comprehensive farmer support as tools to enhance agricultural production (Bonti-Ankomah, 2001). However, the INS has not made any appreciable progress in the area of comprehensive farmer support (Machethe, 2004). Machete further indicates that the South African Government needs to give more support to the extension sector as the primary source of support to small-scale farmers to improve agricultural production, especially at the rural household level. Finding a pathway out of food insecurity and poverty requires a multidimensional approach (World Bank, 2000). De Janvry & Sadoulet (2001: 9-10) identify four pathways which households use to address their food insecurity and poverty: an "agricultural path"; a "multiple-activity path"; an "assistance path"; and an "exit path". In addition, Haggblade, Hazell, & Reardon (2002) identify a fifth path, a "micro-enterprise path". Agricultural path: This pathway refers to using agricultural production by the rural poor who have access to land and other farming resources. However, of challenge to the long-term usefulness of this path is a prediction made by Cour et al., (1998) that people following this path are likely to be marginalised in the future by commercial farmers who are able to apply technologies and marketing systems that current developments demand. This path constitutes the focus of integrated rural development interventions for some time now, and has met with mixed success due to difficulties in adoption of existing rural development packages by rural communities (World Bank, 1997). Multiple-activity path: This pathway refers to rural households using off-farm income sources as their main means of livelihood, and agricultural production as secondary. Households in this path often use off-farm income to finance their farming activities. They are caught between two limited income sources. While these households have land, they are not strategically located for markets which limit income from farming. Off-farm job opportunities are also limited, restricting off-farm income. They must use both income sources (De Janvry & Sadoulet, 2001). Further, López & Valdés (2000) note that the income earned by households in this path is lower on average compared to that for those who rely completely on off-farm sources of income. Assistance path: This pathway refers to extremely poor households that depend on transfers (e.g. remittances from a family member working away from home) as their primary source of income. It includes households without other resources for which remittances are their permanent source of income and households that have other resources but, due to immediate circumstances, use remittances as a temporary income source and as a safety net, protecting them from having to sell off their productive assets. Such households use this pathway to prevent themselves from losing their assets and thereby degenerating from their transient poverty condition to perpetual poverty (De Janvry & Sadoulet, 2001). Exit path: This pathway refers to the situation in which rural poor migrate from their rural environment to urban centres for the express purpose of escaping poverty. Although this seldom features in the discussion of agricultural and rural development, it has been identified as a means used frequently by rural families to cope with poverty and food insecurity (De Janvry & Sadoulet, 2001). Rivera 2004, quoting Berdegué, 2003, argues that the significance of this pathway should not be underestimated in that remissions made by migrants in Latin America amount to several billion US dollars per year. Contrarily, O'Hare & Rivas (2007) argue that migrations mostly result in engendering transfers of poverty to urban centres -urbanisation of poverty in the wording of the UN-Habitat (2003) - and erosion of rural human resources (the educated and young adults) rather than alleviating poverty conditions. Further, O'Hare & Rivas (2007) indicate that rural-urban migration may likely plunge the ordinary poor in rural communities into extreme poverty due to diminution of the human resource base. Micro-enterprise path: This path refers to the situation in which rural poor own and manage businesses for a livelihood, which are sometimes related to agriculture. These businesses often include merchandise and food shops, processing services and storage facilities (Haggblade, Hazell, & Reardon, 2002). Further, Rivera (2004) indicates that people using this path are often better off than those who are solely reliant on agriculture. Orr & Orr (2002) indicate that establishment of an individual or a family micro-enterprise is important for the poor to earn an income. Critically analysing these paths, it is apparent that 'income generation' is central and common to all five pathways, and that agriculture is a major consideration for rural households in deciding how to escape poverty and food insecurity. Agriculture remains an income source in the first two and the micro-enterprise pathways and thus, efforts can be made to strengthen this as a viable income source. Given that the households in the latter pathways are in rural areas, it is suggested that small-scale agriculture be explored as a means to diversify incomes for these households to overcome dependence on remittances and avoid the need to leave the rural area, thereby creating additional options to overcoming poverty and food insecurity. There is no single and specific definition of agricultural extension. Extension as a term was first employed in the description of some adult education programmes being run by the universities of Cambridge and Oxford in England in 1867. The main aim of these programmes was to extend research outputs of the universities beyond their boundaries into the surrounding communities (Jones & Garforth, 1997). Furthermore, Jones and Garforth (1997) state that the effort to disseminate and campaign for the use of improved agricultural systems and management methods dates back several decades in different locations in the world. However, prior to being named as such, the beginning of public extension or advisory systems dates back before 1867, with the United Kingdom and Ireland as the pioneers. Between 1845 and 1851 when Ireland was experiencing a potato famine, it was the public agricultural advisors who came to the rescue of potato farmers by assisting them to diversify production into different agricultural crops. Following this development, European and North American governments institutionalised the services of 'travelling instructors' in the second half of the 19th century. To understand what role agricultural extension can play in addressing South African rural household food security concerns, it is useful to consider the general objectives and approaches of agricultural extension. Swanson (2009) identified four categories or models of agricultural extension: technology transfer; advisory services; non-formal education; and facilitation extension. Groot and Roling (1998) described a similar range of extension approaches. Worth (2006) suggests a fifth approach: facilitated learning. 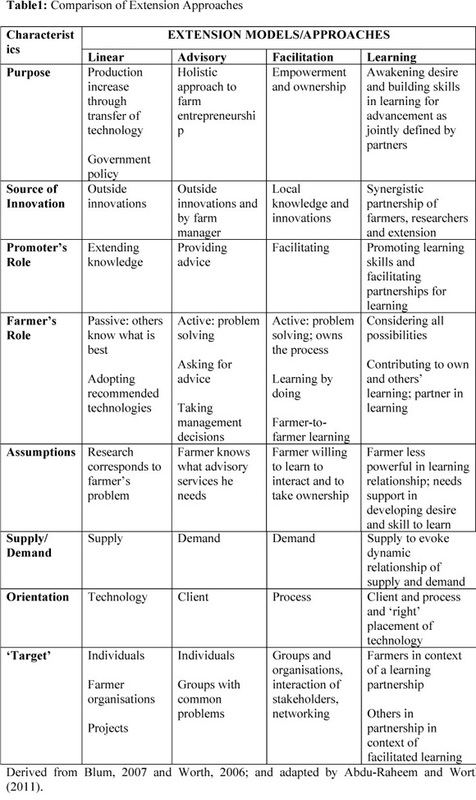 Table 1 provides a brief comparison of four of these approaches using eight critical factors: purpose, assumptions, source of innovation, promoter's role, farmers' role, supply/demand, orientation and target. As South Africa becomes more conscious of the need to combat household food insecurity and rural poverty, extension emerges as a potentially powerful vehicle to achieve this. This is evidenced by the many meeting points between the objectives of agricultural extension and food security and poverty alleviation. Extension can make it possible for rural farming populations to integrate sustainable natural resource management and viable agricultural production with their food production systems. Figure 1 provides insight into how this is possible. 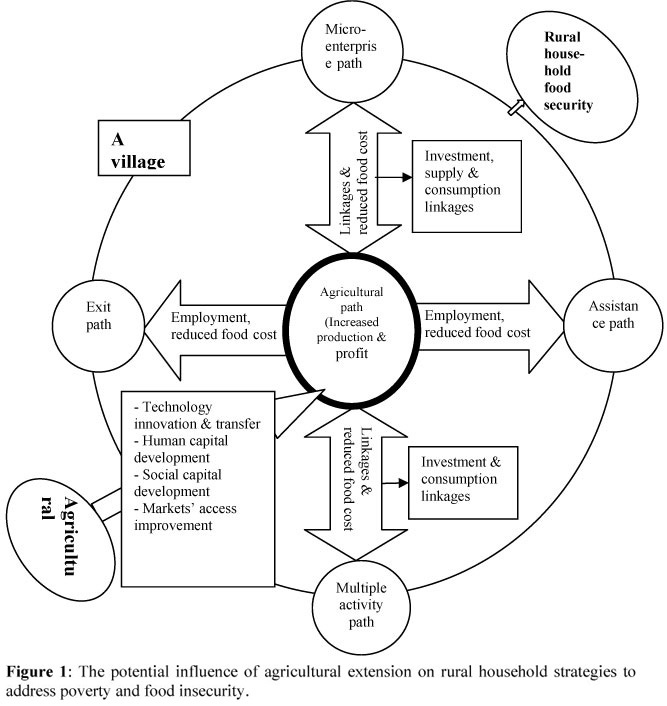 Figure 1 illustrates how agricultural extension influences rural household food security and poverty alleviation strategies through the agricultural path strategy. Its chief instruments of influence are technology innovation and transfer, human capital development, social capital development, and access to markets. Figure 1 further illustrates that the introduction and innovation of agricultural technologies has direct and indirect effects on reducing household poverty. The major direct effect is that technologies lead to increased production for personal household consumption and profits for farmers (de Janvry and Sadoulet 2002). De Janvry and Sadoulet further argue that new technologies lead to higher yields and to reduced production costs which translate into higher profits. The indirect impacts of new technologies are reduced food prices (resulting from higher agricultural productivity and output), employment creation for households in the exit and assistance paths, and general economic growth (through investment, supply and consumption linkages), particularly for households using off-farm sources of income as in the multi-activity and micro-enterprise paths (Berdegué & Escobar, 2002). Technology innovation and transfer in agriculture is a useful strategy, particularly in South Africa where revival of small-scale agriculture has been identified as a potential solution to the problem of involuntary unemployment (Klasen & Woolard, 2008). Farm jobs are created through increased need for planting, weeding, manure/fertilizer application, harvesting, and other production related activities. In Ethiopia for example, Berhe et al. (2009) note that nursery operation, by exploiting the opportunity afforded by limited supplies of planting materials, has resulted in creating employment opportunities for the landless youth and individual male and female farmers; and it also provides it's operators with significant income of between 100 and 11,000 USD per season. Off-farm employment opportunities will arise from "down-stream" post-harvest value-adding activities, such as agro-processing, storing, packaging and distribution. In addition, technology innovation and transfer can lead to increased labour wages (Berdegué & Escobar, 2002). Furthermore, new technologies in agriculture stimulate linkages between farm and off-farm income sources (Reardon, et al., 2001), which consequently result in general economic growth. This is particularly important for those who utilise the multi-activity and micro-enterprise paths for a livelihood. Agricultural growth creates demand linkage for rural off-farm investments by advancing their demand capacities for production inputs and consumption commodities. Supply linkage is created when growth in agriculture provokes off-farm investments' capacities in supplying inputs and services to the agricultural sector. Investment linkage, however, is created when people in the multi-activity and micro-enterprise paths are enticed to diversify their income base by investing in agriculture given its sudden boom with high returns and increased profits in off-farm businesses, while those in farming business act vice versa for similar reason (Reardon, et al., 2001; Berdegué & Escobar, 2002). These direct and indirect effects of technology innovation and transfer are not automatic. They are influenced by a number of factors including how early or late farming households adopt innovations, tradability of the products in question, whether the majority of households in the market are net-buyers or net-sellers (Berdegué & Escobar 2002). Similarly, De Janvry and Sadoulet (2000) note that a key factor in exploiting employment potential, is to educate rural youth for off-farm employment. As shown in Figure 1, extension develops human capital. Developing knowledge and skills among farmers is one of the primary functions of extension. Depending on the area of extension focus, human capacity is built in a variety of areas including agricultural production, farm management, marketing, natural resource management (Swanson, 2006). Such human capacity development benefits households in whatever exit path they are using. The final two of extension's instruments of influence shown in Figure 1 - developing social capital and improving market access - are closely interlinked. Extension builds social capital among rural farmers by assisting them to form "bonds" among themselves (e.g. farmers' associations) and "bridges" linking them to post-harvest operations and markets (Swanson, 2006). This will help them reduce production costs and improve their profit margin through their strengthened bargaining powers in both input and output markets. Also, alliances between farming households brings about more articulation of their needs from extension officers, research bodies and other agricultural institutions (Swanson, 2006). Further, to sustain such social capital, particular attention should be given to organising rural youth (Pretty et al., 2001). This paper has highlighted various means by which agricultural extension can help address food security and poverty at the household level. Its chief instruments of technology innovation and transfer, human capital development, social capital development and increasing market access are effective means of addressing food insecurity and poverty at the household level. The paper demonstrates that, by focusing on enhancing agricultural productivity and profitability (through the agricultural path option), all the other options available to rural households can also be enhanced. Thus, it is vital that agriculture remain an integral part of any government's strategy to address food insecurity and poverty at the household level. Whatever approach or combination of approaches used - technology transfer, advisory, facilitation, or learning - agricultural extension programmes should be reexamined and adjusted so that they are made to contribute to creating and maintaining food security and to alleviating poverty at the household level.